I hope you like my mini shadow box project here and if you're interested, I have a video if you'd like to check it out. (I hope you do and it's the first time I'm doing a voice over.. I LOL-ed at myself, to be honest. ) :) If the video below doesn't work for you, you can click here to go directly to youtube. 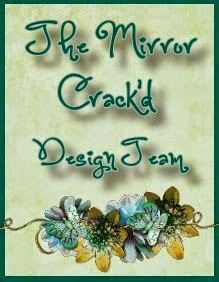 Don't forget to head over to The Mirror Crack'd Challenge Blog to submit your entry and also to check out the rest of the projects by my teammates. The winner of the challenge will a Guest Designer spot for the future challenge and the top 5 entries will be featured. Love this so much, the colours and the design are fantastic, the bicycle, is gorgeous. Great video too. This is gorgeous :) what a beautiful piece of art !! Your entry as a DT simply BLEW ME AWAY. I was so impressed, I decided to join the challenge. You created a lovely, lovely entry, so romantic and feminine. I'm sure others are as impressed and inspired as I was when I saw this entry. Add to that the great video and it's a real winner. Lovely Marina, gorgeous colour scheme and details. I love your shadowbox- the colours are gorgeous! I am speechless! What a gorgeous project! Wow, very very beautiful project!! This is awesome! Just beautiful!